This is the Main lawn with the preferred landing location shown with a white cross. If you are staying with us for two nights then it’s free to park, if you are not staying with us the fee is £100 a day, if dropping off it’s £50 per visit to cover our time. 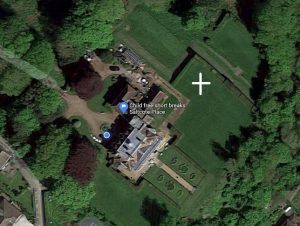 Please use the main lawn unless otherwise directed and do not fly over the formal rose gardens between the house and the cliff.